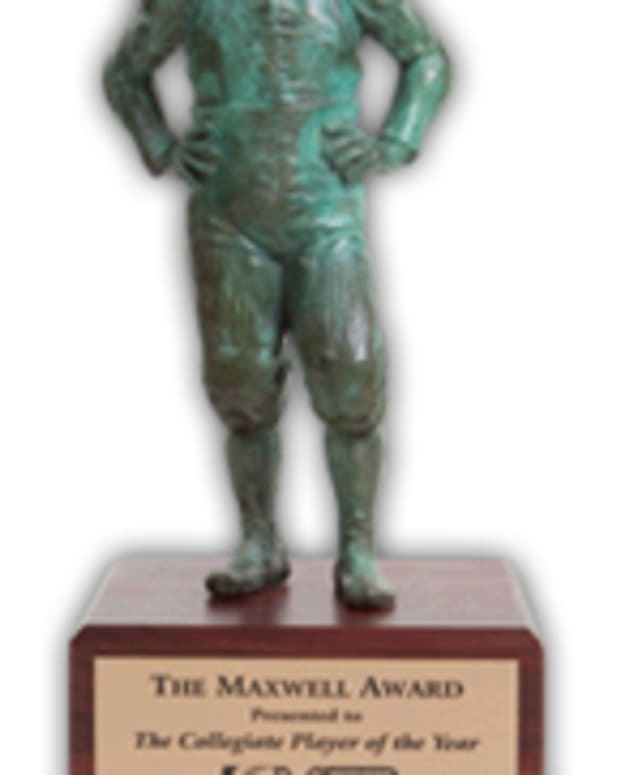 The Maxwell Football Club announced its semi-finalists for the Maxwell Award Monday, which you can view HERE. Andrew Luck has been the Heisman favorite since deciding to forego the NFL Draft and stay at Stanford for the 2011 season. The decision has not disappointed Cardinal and college football fans alike. Last week against Oregon State, Luck completed 20-of-30 passes for 206 yards, three touchdowns and one interception as Stanford won its national-best 17th straight game. He is ranked fifth in the FBS in both TDs and passer rating, and eighth in completion percentage. He has incredible command of the huddle and his field vision is unparallel. Luck is the proto-typical NFL QB, which has led many to believe he will be the overall number one in the 2012 draft. Houston’s senior quarterback entered the list at number 10 two weeks ago, and climbs closer to the top week after week. Last Saturday, Keenum completed 39-of-44 passes for 407 yards and two touchdowns while rushing for his first two scores of the season in the 56-13 blowout against UAB. He is a major part of the Cougars’ success this campaign as he sits near or atop almost every QB category in college football. Case leads the country in passing yards, yards per game (402.9), and touchdowns and is second in rating, and yards per attempt (10.4), and tied for second in completion percentage. His three picks put him tied for third least, but the 17 QBs ahead of him don’t have nearly the amount of attempts Keenum has. Kellen Moore may not be as mobile as some of the other QBs on the list, but he in incredibly smart and is a tremendous leader. Boise State is now fifth in the BCS standings which helps Moore in the awards race. After the win against UNLV, Moore now holds the NCAA record for most wins by a college quarterback at 46 and has 128 total career TD passes. Moore is tied at second in the nation in completion percentage, second in touchdowns, and forth in rating. If Boise State can beat rival TCU, Moore has an excellent chance of ending his collegiate career with 50 wins. Trent Richardson is the Tide’s workhorse who had six straight games with at least 100 yards rushing and only three below triple digits. Richardson has topped 200 all purpose yards three times (against Arkansas, Florida, and Mississippi). A lot of the buzz surrounding Richardson is due to playing for one of the best teams in the country in the best conference in the country. Richardson is tied for fifth in the country for most touchdowns by a running back and is eighth in total yards. Wilson’s stock began to slip as Wisconsin had back-to-back losses and with it, his game play. The usually efficient QB threw two picks against Michigan State, and had a completion percentage of 62.5% against Ohio State, but Wilson seemed back in his groove Saturday completing 15-of-20 passes for 205 yards and two touchdowns. He added 76 yards and a score on 10 carries in the 62-17 win over Purdue. Wilson’s passer rating leads the nation, and he is sixth in the FBS in completion percentage. Wisconsin is already out of the BCS title hunt and chances to repeat as Big Ten Champions are slim, but he still has a chance to pull off big numbers the remainder of the schedule. His poise was shaky in both losses, but he looked great against the Boilermakers and is athletic, smart, and still one of the most electrifying players in college football this season. From his accuracy to his touchdown-to-interception ratio, Robert Griffin III’s numbers are still holding strong amongst the best in the FBS, but Baylor’s three losses were forcing Griffin’s stock to decline, just as Wilson’s did. But a string outing in the 42-39 win against Missouri may have gotten Griffin back in the hunt. Saturday was Griffin’s third game in as many weeks throwing for over 400 yards as he completed 27-of-41 passes with three touchdowns and added 64 yards and a score on the ground. Individually, there is very little he can’t do better than almost anybody and based off of game film and statistics, Griffin is deserving of the “one of the best football players in college” tag. Griffin is tied for second in completion percentage, second in total offense (395.9 ypg), sixth in yards per game (347.6) and third in rating and yards per attempt (10.1). James missed back-to-back games with a dislocated elbow he sustained against California, and had only 13 attempts for 53 yards against Washington State, but seemed back to 100% against Washington Saturday night. On the road, James ran for 153 yards and a touchdown on 25 attempts, and had one reception for six yards in the 34-17 victory over the Huskies. James leads the FBS in all-purpose yards per game (194.7), rushing yards per game (151.57), seventh in average yards per attempt (7.98) and 11th in total rushing yards. Woods had a decline in productivity the last couple weeks, but went back to big things against Colorado Saturday catching nine passes for 130 yards and two scores. Woods is a solid second ranked in the nation in touchdowns (tied) and receptions and fourth in both yards per game (124.6) and total receiving yards. With Broyles out for the remainder of the season, Woods’ only competition for best receiver in the nation is last year’s Biletnikoff winner, Justin Blackmon. This being the year of the quarterback, it’s going to be hard for a non-QB to win the Maxwell this year. 19 punt returns, 196 yards. Although Oklahoma picked up the W against A & M this week, they lost Broyles, the record-holder for most receptions in NCAA history with 349, for the season with a torn ACL. Broyles also holds the record for, most receiving touchdowns in the Big 12 with 43, and the school record for yards in a game with 217. Two weeks ago against Kansas State, Broyles set the Big 12 mark for career receiving yards at 4,499, and broke that against the Aggies with his 87 receiving yards for a career total 4,586. Before Saturday, Broyles lead the nation in receiving yards per game (133.8 ypg), and was tied for second in both receptions (81) and touchdowns (10), and solely sat at number two in the FBS for total yardage (1,070). Broyles is still second in total yardage (1,157), but slipped to second in yards per game (128.6) and is now tied for third in touchdowns and receptions (83). Although his season may be over, his production through the nine games are still fantastic enough to keep him in the top ten another week. “Honey badger takes what he wants” is a popular term and tee-shirt depicting a honey badger in the “Heisman pose” with those words underneath. Tyrann Mathieu is the honey badger. Mathieu stands out not only in a conference known for defense, but on a team that ranks third in total defense, eighth against the pass, and second in scoring and rushing defense. He is one of the best defensive players in the nation, but is often overlooked in Heisman talks due to an incredibly strong quarterback class. Mathieu didn’t played for two weeks as he was suspended for the Auburn game followed by a scheduled week off, and didn’t blow anyone away in the biggest game of the 2011 season against Alabama Saturday recording five total tackles (4 solo).